Now after your wedding, you may be wondering how to wear wedding rings? Do you still wear your engagement ring? Do you wear them on the same finger? What if they clash? What exactly are the rules for wedding rings? Or, what if you also have a promise ring that has sentimental value? What if you have been with your honey since high school and he bought you a promise ring when you left for college? Ang of course, what if you still want to wear that ring as well? So many questions! Of course, you would think that you wear both your engagement ring and wedding ring on your ring finger? But which hand? 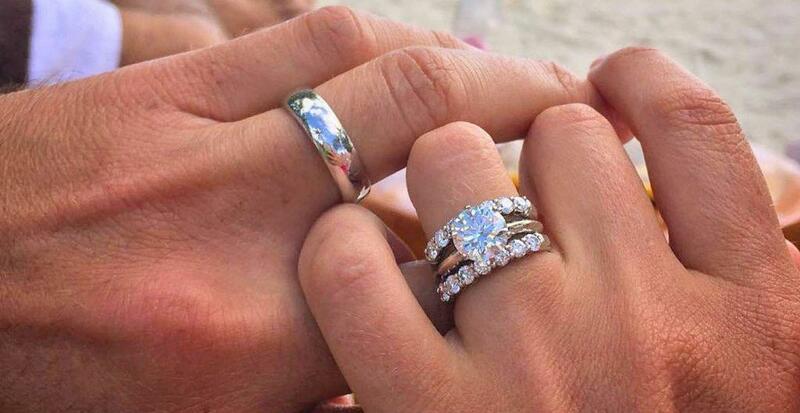 Do you wear your engagement ring on the one hand and the wedding ring on the other? Are you a traditionalist? Or are you one of those women who like to set her own standards? We have all the answers on the proper way to wear your wedding band, engagement ring and/or promise rings. Ever wonder why women where their wedding band and engagement ring on the fourth finger of the left hand? Ancient Romans called the fourth finger as the “Vein of Love” because it ran directly to the heart. Therefore, married couples were to wear their wedding bands on this finger as a symbol of their undying love. Wedding rings originated in ancient Egypt. Where the circle was symbol of eternity as it had no begging or no end. Today, it is usual for the couple to wear rings on the 4th finger to symbol their promise to wed. Couples who are not ready for marriage yet, often exchange promise rings to show their commitment to each other. They may wear rings on the 4th finger of the left hand. Just like an egg magnet ring, but it’s really a matter of personal choice. Since it’s not an actual engagement ring, a lot of women chose to wear their promise ring on a different finger. Traditionally, if you have a promise ring, you would move it to the 4th finger of your right hand after the wedding. This is the most traditional methods for ring placement. You would wear your rings n the order your record the fourth finger of your left hand. This means you would wear the engagement ring on the bottom and the wedding ring on top. However, not all ring styles may fit together in this manner. A lot of women prefer this method as they want to wear the rings in the order because HE placed the engagement ring on the fourth finger of the left hand when he initially proposed. And it is perfectly understandable that she would want it to remain on that finger permanently. It is also traditional to wear both rings on the fourth finger of the left hand, but place the engagement ring on top. Traditionally some women prefer to wear the wedding ring on the bottom as they feel that it keeps the wedding ring closer to the heart, as in the original Roman custom. With these two methods, it all depends on how your rings “fit” together. If they are band, you would wear them whichever way they fit. If they are not part of a set, you would wear them whichever way you prefer or whichever way they look best. Less traditional, but still common practice, is to wear the engagement ring on the ring finger of the left hand and the wedding band on the fourth finger or the right hand. This is a good option for those who feel uncomfortable wearing both rings on one finger, such as those with smaller fingers. Or if your rings do not match, or in fact clash, you can wear them on separate hands. Each ring might be stunning on its own so they might look best on opposite hands. It is also common to wear the engagement ring on the 4th finger and the wedding band on e middle finger of the same hand. Although it is customary that women wear both rings after the ceremony, some of them chose to wear only their wedding band. They save their engagement ring, which is normally the more exquisite and expensive ring, for special occasions. As well, some women do not like to wear a lot of rings or may be worried about damaging their diamond ring while engaging in work or household chores. No matter what decision you make as how to wear wedding rings, the choice is ultimately yours. The main thing is that you are now happily married! So wear your promise ring, engagement ring and wedding band as you see fit and enjoy your life as a newly married woman!